Across Seattle, boozy milkshakes come as frills-free as a frosty drink topped with a shot of Baileys or as fancy as a carefully concocted cocktail. Here’s where to get a sip of these creamy, spiked shakes. An Airstream trailer food truck turned restaurant chainlet, Skillet uses locally made Snoqualmie ice cream in its shakes, plus unique additions like “mad mint” vodka from Seattle distillery Batch 206 for its boozy Peppermint Patty. 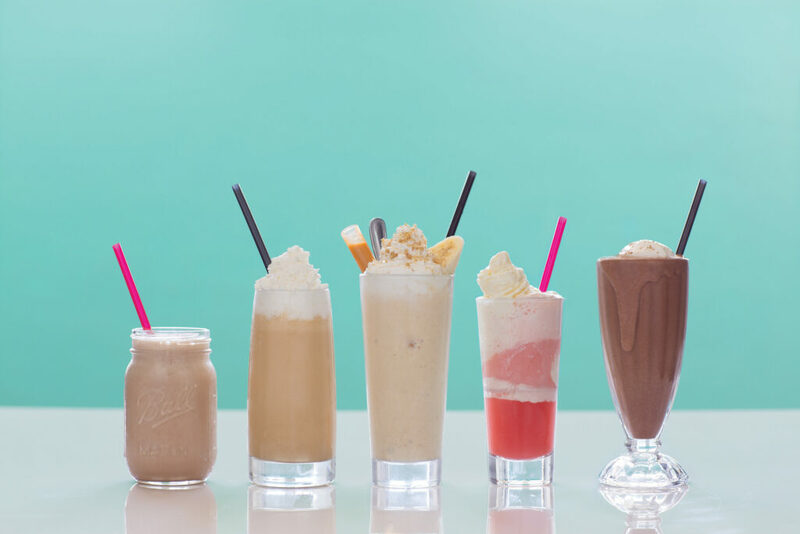 The comfort-food menu at this cozy eatery includes milkshake flavors like banana caramel and brownie, all available with a shot of vodka upon request. Owner Jeffrey Wilson says adding alcohol to his restaurant’s liquored-up shakes gifts them with a silky-smooth texture. If the Tang cocktails and duck-and-pork “dork” burger weren’t enough of a hint, this joint is equal parts zany and scientific. Picks include the peanut butter and banana “Drunken Elvis,” served with a test tube of banana rum, vanilla vodka, and Baileys. Owner Rachel Marshall’s namesake brewed ginger beer is nonalcoholic, but she uses it to mix some distinctive cocktails, including a vodka Moscow Mule. Add soft-serve ice cream from Lynden-based Edaleen Dairy to that equation, and it becomes a dreamy Moscow Mule float. A popular pick at this Ballard dessert shop is the smoked-chocolate-and-scotch shake, blending peaty Laphroig scotch with owner Autumn Martin’s smoked chocolate chips and chocolate ice cream. Also find seasonal options, like a caramelized date shake that uses citrusy amaro and nocino made from walnuts grown right here in Washington.